If you purchase a large hosta in a half-gallon pot (like the green and gold ‘Wide Brim’ pictured up top), you can divide it into a number of smaller plants. Just let it dry out a little before the operation. Dry soil and dry roots are easier to cope with than wet ones. First, knock the plant from its pot. Then with a sharp knife or pruning saw, cut it into equal-sized rooted segments. As you can see from the picture above, ‘Wide Brim’, which I purchased for $12, produced 5 good-size plants after division. Thus, my hosta-expense was reduced to $2.40 per plant. 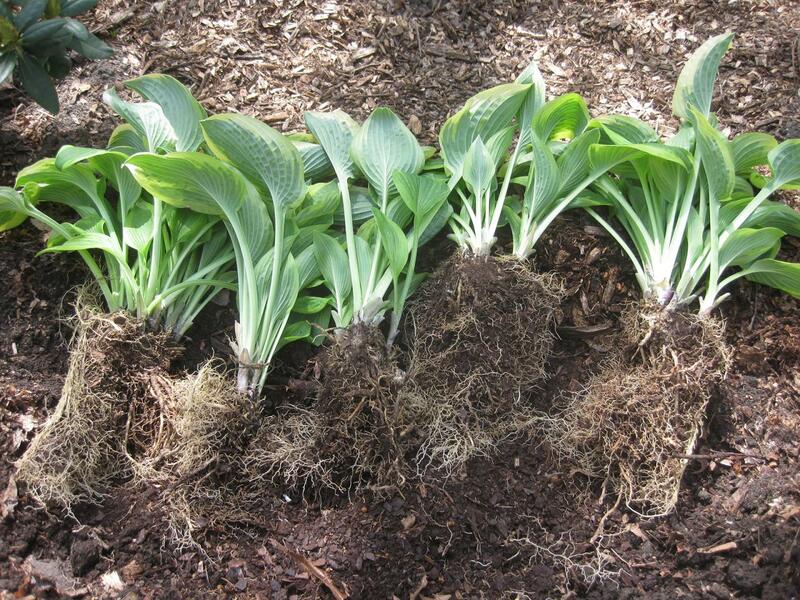 Of course if you already have hostas growing in the ground, you can increase your stock for no cost at all. In spring, simply dig the clumps out, and divide them. You’d be amazed at the number of free plants you’ll acquire this way — plants you can use to frame your own shady garden path or border. 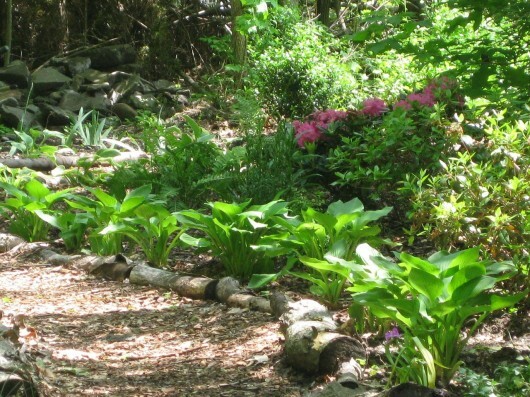 Hostas recover from the division-trauma with remarkable speed. Mine, planted in well-worked soil, and watered daily for two weeks, grew on without missing a beat. Should your hostas wilt after transplanting, just spray their tops with water once or twice each day for two weeks. Well. By now you are probably itching to start a hosta-dividing project. And I don’t blame you. It’s fun to achieve champagne beauty on a beer budget! Thanks for the reminder! I inherited huge hostas when I bought my house, and they are in desperate need of dividing. I'll probably plant them in circles under the maple trees here. Good luck with your Hosta Walk. Can't wait to see pictures! Kevin, I love your “can do” attitude. I'm the same way: if I want something, I make it happen! What a great idea. I live in Manhattan and dream of having hostas around me. Welcome, Sherry. When I lived in Manhattan, I surrounded myself with ferns, which flourished in a lavish window garden. Well, it's ALMOST like having hostas! I've been meaning to divide the hostas that came with my house…but have been somewhat afraid of killing them. Perhaps this is the year. Is there a proper time to do it? Katreader – now is the time to divide hostas. And don't worry about killing them. I've divided mine with utter brutality, slicing, with a saw, right through the roots. Replanted in decent soil and watered daily for 2 weeks, they recover almost immediately. susieQ – It’s interesting…deer have eaten my common, green hostas, but have left the ‘Wide Brim’, ‘Blue Angel’ and some kind of “elephant ear”-type hostas alone. Must have something to do the texture of the leaves. As for slugs — I had them, too. Then I sprinkled horticultural lime around the plants. Worked like a charm. Delightful! I already have my woodland walk envisioned and plan to get it started this evening. Thanks for the inspiration. Nice to meet you, Delinda Lea. A woodland garden can be very relaxing in summer. Have fun with your project. Kevin, my sister Pepi, also a reader of your blog, told me about an easy peasy method for dividing hostas already in the ground. She learned it from a neighbor last year. I tried it this year — two weeks ago — and everything I divided is looking happy and healthy. Instead of digging up the plant I wanted to divide, I did this: I wanted to divide each hosta into two plants. I dug into the ground outside the root area for halfway around the plant. Then I dug straight down through the middle of the plan, using the shovel to cut the plant in half, and lifted the half to be transplanted out of the ground. The other half remained in the ground, mostly undisturbed. I divided 8 hostas in less than 10 minutes! Also, for slugs, I use broken up eggshells sprinkled around the perimeter of the plant…they don’t want to cross the sharp edges and there’s the added benefit of nourishing the soil. Thanks for all your good wisdom and advice, Kevin. When I have a gardening question, I usually start by doing a search on your site! I love dividing plants, such a thrifty and excellent way to fill a big space. My mom even sent me some Hostas from her plants, in the mail! She just packed them up in a big watertight envelope, and even though they took a few days longer to get here than we anticipated, they took to the garden totally fine. Such amazingly hardy plants. Now we’ll just see how they adapt to my zone 3 yard when they came from zone 9! Oh dear! How lush and healthy your Hostas look. Last spring, I spotted a crown of them which someone had dumped in a grass verge. They had been left upside down so the shoots had made a u turn and headed to the light. I stopped the car, jumped out and they were winging their way home with me in double quick time. I divided the clump into 8 and planted them in pots. They did very well throughout last summer and this year were making good progress as we had an unseasonably warm fortnight at the end of March. Then………… a week of frosts in early April. Now the leaves are mushy and ragged. Heres hoping they will recover. Mary – Good for you for rescuing those poor orphans! Hostas are extremely durable. The frost-bitten foliage will soon be replaced by fresh, green growth. I love the story above of angela getting hostas by the mail. 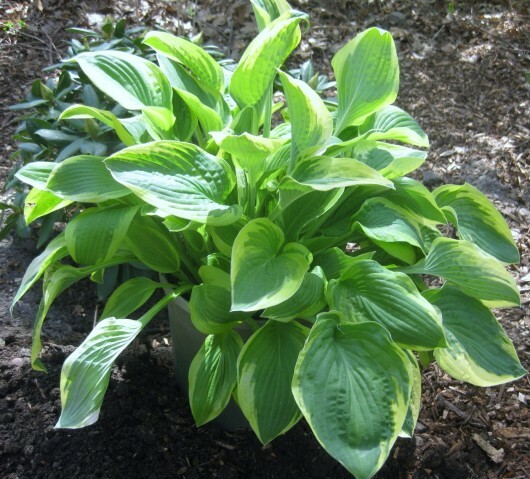 They are certainly hardy and I don’t think there is ever need for someone to buy one, save looking for a very particular variety, because hosta owners are always looking to unload, especially if you live among smaller lot sizes. I moved the hostas I told you about w/ very little disruption to the crocuses. For the most part there was still some room between the bulbs and the tightly packed hosta root system. I handled the removal w/ surgical precision, albeit w/ a garden shovel. The hostas will have a nice place on the north side of my garage where they can lighten things up, and my rhododendron can finally breathe a little. And I get to keep my crocuses! Oh, I was wondering! I think I remember reading somewhere that if they come up in a circle with nothing in the middle that means it’s time to divide them… is that right? I’ve got one that’s doing that. I got a lot of my hosta’s from a Freecycler …that is a wonderful way of finding plants for free..! I so enjoy your blog and want to thank you for your wonderful articles, photos, and gardening advice. Dividing hostas is my next gardening delight! Thanks for sugesting the use of a knife – I have never done that before and can see where it is a great time-saver! I did this this year and have hostas everywhere doing great. I love all different kinds and am beginning to be a collector. One of my mistakes though has been to plant the minnies in beds. They are a little to fragile and don’t always make it through the winter and crowding of other plants. Live and learn though. I transplanted some hosta’s from the back of my apartment to under a tree (red haw) in front, 4 years ago. I did separate them up, cause they were so crowded. Before they were 3 feet tall with flowers and now maybe 1 foot and no flowers. And now they still look small and thinning that they look sick. What can I do to make them more alive again? — I love the tree branch fence. I too have done this around my flower garden. My apartment manger cut a tree down and left a mess for several weeks. So I helped myself to make a natural fence with the branches. I think it as a home for the local bugs and also a place for the birds to find their lunch …. LOL! I love my hostas, but, so do the voles & moles. It is a constant battle though I have no weapon. It’s survival of the fittest at my hacienda! Thanks for your lovely sharing!!! Interesting answers, glad I asked the question. In turn, I haven’t yet gone out to divide my Hostas. We get alot of sunlight here in 98% of our yard. I know the Hostas will burn in direct sunlight. Pincher bugs (long brown with pinchers on their tail) eat the heck out of yard plants. Anything for them?? The egg shells…birds love them and I always throw them around my plants for calcium. I feel guilty putting them in the trash. Good luck with the Hostas gang. Love the idea! Going to search for new locations to place my divided Hostas! Thank you. The west side of our yard has a natural hatred toward grass so we decided this spring it would be devoted to Hosta’s ! So far we have divided about 2 dozen and they are doing great ! I bought 3 varieties that I didn’t have and divided them too ! Our Lily-of-the-valley are spreading out and I had already planted about 2 dozen volunteer lilacs there. Now with the picture of your woodland walk I am even more inspired to work on our Western Wonderland ! Thanks !!!! Is it possible to divide them in the summer time?? I have some that desperately need to be divided, but am too anxious, and not wanting to wait until next spring if possible…..
Hi susieQ – Your hostas are entering their dormant period now. Go ahead and cut the plants back to the ground. Wait until spring to accomplish division. wondering if I can cut off the leaves after I divided my hostas. they are wilted and have been for over a week. if I cut back will they regrow? I’ve divided hosta in the spring, summer and fall. If kept watered, they do fine. If dividing in the fall, I’ll cut off the leaves, since it makes the whole dividing process so much easier. Then the plant can send it’s energy to regrowing roots instead of going to the leafy tops. If it’s early enough in the season, if you cut off leaves, more might grow. I’ve done that when I had a slug attack and the leaves looked just terrible. I did get new growth. Even if you don’t get new leaves, you’ll only have part of one growing season without foliage. You should have a sturdy plant next year. What’s the best time of year to divide and move a large and mostly happy hosta (getting slightly too much sun … just a few hours but afternoon … my guess from the slight leaf wilt on the edges? I have a few hostas in pots outside (zone 5). Do they require a dormant period or can I just bring them in and keep them under lights for the winter? Hi Kevin! Great post and very inspiring. Your advice has saved me a ton of money! Thank you. I have some question for you or anyone! I have three hostas that I’ve divided and transplanted. At least one of the divisions had, oh maybe, one or two little roots but a substantial piece of crown (or whatever that big white part in which the roots grow down and the stems shoot up is called!). I planted it anyway. Do you think it will grow with so few roots? Will that crown(?) produce roots at this time of year—September in Pennsylvania? Also, I did not cut the stems back before I did this. I realize now I probably should have. I’d like to cut them back to stimulate as much root growth as possible for the transplants now before winter, but I’m worried doing so will over-shock them. What do you think?